Challenging a will is never fun, and it is certainly not easy, but in certain situations, it is necessary. Though grounds for challenging a will vary from state to state, it is safe to assume that if a will was not signed in accordance with state laws, that the testator lacked the capacity to sign a will, the testator was coerced against his or her will into signing the will, and/or there was fraud involved, that the will is not valid, in which case, it would be necessary to contest it. Bearing that in mind, not just anyone can challenge a will in Florida. If you want to challenge a loved one’s will but are not sure how to go about doing so (or even if you have the right to), reach out the to the knowledgeable Fort Lauderdale probate attorneys at the office of Edward J. Jennings, P.A., to learn more about your rights. Not everyone can challenge a will, so the first step to ensuring justice for you and your family is to establish who of you can contest a will and who cannot. Those Named in the Will: Individuals who are named in the will have the legal right to contest it if they see fit to do so. This includes charities and any organizations that stand to benefit from the inheritance, as well as any pets named. However, it does not include beneficiaries who have passed away. Those Who Would Qualify as an Heir: If, under state law, a person would qualify as an heir if the testator but if they were not included in the will, he or she would have the legal right to contest the will. Those Named in a Previous Will: If the testator named a person in a previous will, but then drafted a new will and excluded them, they would have the option to challenge the new will and the motivation behind the change. However, in order to do so, they must prove that the previous will was valid. 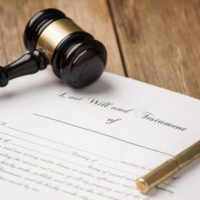 There is a Presence of an Exclusion: If a testator disinherits someone out of his or her estate plan, the person disinherited will be given the opportunity to contest the will and determine whether or not the disinheritance is valid. In many situations, instances of exclusion are the result of undue influence or lack of capacity. If you are any of the aforementioned individuals and if you believe that you have valid grounds to contest a will in Florida, you have the legal rights to do so. Some testators will include a clause that states that anyone who challenges a will can be cut out of it. In Florida, this type of clause is invalid. Under Florida Statute §732.517, “a provision in a Will purporting to penalize any interested person for contesting the Will or instituting other proceedings relating to the estate is unenforceable.” If your loved one’s will includes any such provision, you do not have to worry about losing your inheritance if you raise an issue. If you believe that you have the grounds to contest a will in Florida, reach out to the Fort Lauderdale probate litigation lawyers at the office of Edward J. Jennings, P.A. to schedule a consultation today. We can hear your claims and help you decide if contesting the will is a good idea and, if so, how to go about doing so in a timely and cost effective manner.